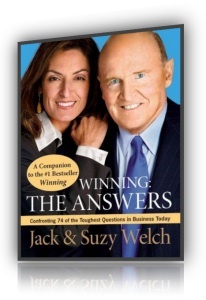 In Winning, their 2005 international bestseller, Jack and Suzy Welch created a rare document, both a philosophical treatise on fundamental business practices and a gritty how-to manual, all of it delivered with Jack’s trademark candor and can-do optimism. Instead, Winning uncovered an insatiable thirst to talk about work. Since the book’s publication, the Welches have received literally thousands of questions from college students and seasoned professionals alike, on subjects ranging from leadership and global competition to tough bosses and building teamwork. Indeed, questions about virtually every business and career challenge have poured in—some familiar, others surprising, many urgent and probing, and all of them powerfully real. In April 2005, we published a book called Winning. To our minds, its purpose couldn&apos;t have been more straightforward: we wanted to codify our thinking about the myriad insightful, probing, and often urgent questions we had received while traveling around the world for three years, speaking to hundreds of thousands of people about their work, career, and life challenges. We wanted, basically, to write a book that was both a philosophical treatise on fundamental business principles and gritty how-to manual in one, and in doing so, pretty much wrap up what had felt like a great, extended conversation. Little did we know that Winning wouldn&apos;t wrap up anything—just the opposite! There was the book tour, of course, and you expect some action doing that—you&apos;re out looking for it! But along with the usual TV and radio appearances, we also visited thirty-seven business schools across the United States and in Europe, and spoke to more than one hundred business groups in cities around the world. Winning, we quickly discovered, wasn&apos;t the “Hmm, very well then, thank you” summary event we had anticipated. It was a “Hey, wait a minute, what about—” kind of affair. Winning, in essence, proved to us once again that people have an insatiable thirst to talk about work. They want to understand it better, debate its every nuance, and find a way to do it better. Even after the book tour ended, the questions kept coming. In the past year alone, we have heard several thousand questions. It is an understatement to say the topics run the gamut. There is the very macro, as in, “How can developed nations compete with China?” and “What is the role of Wal-Mart in society?” And the very micro, as in, “How do I overcome my fear of public speaking?” and “How do I manage the team I was a part of—until yesterday?” An IT manager in Michigan asked us about the future of the European Union, and a CEO from New Jersey asked us to list the most important characteristics to look for when hiring a sales force. Hundreds of people have asked about how to get ahead in their careers, dozens about surviving a difficult boss, and two about the appropriate use of candor with elderly workers. We&apos;ve heard from scads of employees at family-owned companies frustrated with an incompetent aunt or cousin at the helm, or otherwise at the end of their rope with nepotism. In a letter filled with poignancy, a recent college graduate from South Africa asked us how to acquire self-confidence. She said she was starting from zero. In another filled with bittersweet reflection, a British correspondent asked us how he could regain his, which he&apos;d lost after being fired for poor performance. Some letters have been amusing, like the one from the Indonesian manager who asked us how she could stop her team from explaining all their decisions with the excuse “It was gut instinct!” And others dead serious, like the one from the Milwaukee engineer who said, “The time has come for me to advise my grandchildren what to do with their lives. Indeed, there has been so much give-and-take since Winning&apos;s publication that we&apos;ve often been reminded of what a Dutch entrepreneur told us during a visit to Amsterdam in 2002. She was more right than we could have ever predicted! About a year ago, we realized that we had actually fallen in love with the continuing conversation sparked by Winning. For two people who get a kick out of talking and meeting people, it was pure fun. But more than that, it was fascinating. With every new encounter, we learned what people—young, old, and in between—working in completely different kinds of businesses and in vastly different parts of the world, cared about most passionately. We learned that in Africa, for most people, it&apos;s about starting anew. People are desperate to find ways to launch companies and careers; they dream of breaking out of the survivalist lifestyle. The continuing conversations after Winning also pushed us to delve into our own thinking more deeply and to explore more than a few business and career issues that we hadn&apos;t included in the book. Both were mind-expanding activities, to say the least. And finally, opportunities to talk to global audiences that followed Winning allowed us to keep spreading a message we think isn&apos;t proclaimed nearly enough—that business is the great engine of society. It creates jobs, pays taxes, and opens up economic opportunity like no other institution. Yes, government plays a huge supporting role—we couldn&apos;t live in a civilized world without its services. But with its ability to provide for families, build careers, and give back, business, we believe, is the foundation of a thriving world. And so, in September 2005, we took the New York Times Syndicate up on an invitation and started to write a weekly Q & A column that now appears in forty newspapers in countries around the world, from England and Japan, to South Africa and Mexico, to Sri Lanka and Bulgaria. In the United States, the column appears every Friday on the back page of Business Week magazine. The book you now hold in your hands draws on the questions to our weekly columns, but also includes questions from our book tour, as well as questions we have received during recent speeches and classroom discussions. In general, all these questions fall into three categories. The first is questions about the ideas that originally appeared in Winning, but with a twist—or a shove. For instance, many people have told us they agree with Winning&apos;s message that candor makes business (and life) immensely better, but they cannot understand how it can be implemented in various situations, such as the polite cultures of Asia. Similarly, hundreds of people have written us about Winning&apos;s case for differentiation, the ranking of employees into the top 20 percent of performers, the middle 70, and the bottom 10. Good idea, many said, but how can differentiation possibly be implemented at small companies, or growing companies, or sinking companies, or family companies, or Swedish companies, or you-name-it companies? The second category includes questions on topics not covered in Winning itself. These mainly coalesce around entrepreneurship and family business, but there are also questions about work and career situations so specific it didn&apos;t dawn on us to include them. One of our favorites is from a secretary who, after getting her MBA at night, still finds her company won&apos;t promote her. This entirely common problem of “embedded reputation” should have been in Winning. Thanks to questions from readers around the world, we also get a chance in this book to write about the important topics of what really motivates people, the challenge of suddenly becoming the boss of your former peers, and the three performance measurements we think make the most sense for general managers. The final category of questions in this book concerns current events. With their long lead times, books in general do not tackle breaking news, and Winning was no exception. Our columns have allowed us to do that, with some incendiary results. Indeed, the questions (or, should we say, the answers!) in this book that have sparked the most debate are those we wrote on why women don&apos;t become CEOs more often, Wal-Mart&apos;s role in society, and the Enron verdict. With the first of these, we received numerous e-mails, most of them very thoughtful, about our assertion that women&apos;s careers are changed, not necessarily for the worse, by biology, i.e., having babies. The reaction was not nearly so civilized when we wrote about what we consider Wal-Mart&apos;s positive impact on the world. Yes, 65 percent of the letters that poured in supported the giant retailer and bemoaned its regular beating in the media. But the rest lambasted us and thoroughly decried the company as a destroyer of communities. Finally, much to our chagrin, our Enron answer was met with general negativity. We&apos;d said the company was a rare case of corporate malfeasance. Dozens of e-mails from around the world made the case otherwise. A word on how this book is organized, which is not by the three categories just outlined! Instead, to help you navigate targeted areas of interest, it is organized by subject matter. Every question we receive is unique, of course, but that said, many do fall into topical buckets. That is why one section of this book includes the best, most representative questions we have received about global competition, another focuses on working in a family business environment, and another on leadership. In all, there are six sections, about as wide-ranging in their scope as business itself. This book, incidentally, features seventy-four questions and answers. There could have been more, but we&apos;ve learned that it would be folly to try to be all-inclusive in any book about work. The questions that follow cover dozens of important topics, and perhaps every topic that is important to you. But they do not cover everything. Like life, the conversation about work will go on and on. Competitive dynamics never stop changing. And so, questions will keep coming. We look forward to listening to them all. Does an MBA Really Matter? A Case of Embedded Reputation? What Do You Call Winning?